Manoel Dias Soeiro (1604-1657) was born in Madeira, an island off of Portugal, where his parents fled from the Portuguese Inquisition. They soon moved to the Netherlands, where Soeiro grew up and became a respected rabbi and author, known by his Hebrew name Menashe ben Israel. 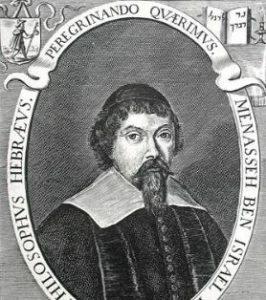 In Holland, he established the first Hebrew printing press at the young age of 22, and his writings (in five languages!) would gain great fame, not only in the Jewish community, but among the greatest scholars and philosophers of the age, including Vieira, de Groot, and Huet. A portrait of Soeiro was even painted by Rembrandt! A great kabbalist, Soeiro wrote and published one of the earliest Jewish treatises on reincarnation, called Nishmat Hayim. Among his students was the infamous Baruch (Benedict) Spinoza. In 1638, Soeiro moved to Brazil. At the time, there was a popular notion that the natives were actually the Lost Tribes of Israel. This inspired Soeiro to take up the role of helping Jewish causes around the world. His first stop was England, where virtually no Jews lived since they were expelled in 1290. Soeiro worked hard to open the doors to their return, and in December 1655, the re-admittance of Jews to England was granted. Sadly, Menashe could not continue his work. Upon return to the Netherlands, his son passed away. Unable to contain the grief, Soeiro passed away himself in the midst of the funeral. As they set out from their place above, each soul is male and female as one. Only as they descend to this world do they part, each to its own side. And then it is the One Above who unites them again. This is His exclusive domain, for He alone knows which soul belongs to which and how they must reunite. This entry was posted in Religious Leaders and tagged Author, Brazil, de Groot, Dutch Jews, England, Grotius, Holland, Huet, Inquisition, Kabbalah, Kabbalist, Lost Tribes, Madeira, Netherlands, Nishmat Hayim, Portugal, Portuguese Jews, printing press, Rabbi, Rembrandt, Sephardic Jews, Spinoza, Vieira on February 7, 2013 by Jew of the Week.